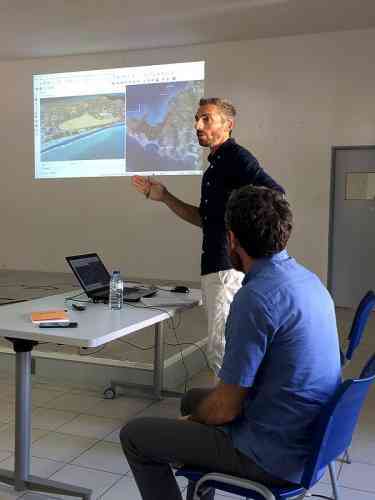 MARIGOT–The first public presentation of the new revised Plan de Prevention des Risques Naturels (PPRN) was given in the Chamber of Commerce this week by Elie Razon and Jerôme Peyrus, the responsible persons for natural risks at the agency Direction Environment Amenagement Lodgement (DEAL). The PPRN is a multi-risk plan that takes into account the risks of hurricanes, flooding, ground movement, earthquakes and soil liquefaction. The presentation focused on the flood risk zones. Based on the damage and flooding caused by the storm surge during Hurricane Irma in 2017, the new plan will be a complete revision of the last version of the PPRN in 2011. French Republic President Emmanuel Macron had demanded the update on his official visit in September 2018. The new plan will also assist the Collectivité in formulating its urban planning regulations. While the flood risk zones still have to finalised, the presentation permitted insight into what the final plan will look like when it comes out in 2020. Attending the presentation were Préfète Déléguée Sylvie Feucher, Vice President of the Collectivité Yawo Nyuiadzi, and Territorial Councillors Pascale Alix-Laborde and Jean-Sebastien Hamlet. There was some criticism, particularly from Sandy Ground district council representative Cedric Andre, on why the presentation was given on a weekday in the morning when most people have to work, but more public presentations are planned. Following Hurricane Irma in 2017, and assisted by satellite images, measurements were taken by Centre d’Etudes et d’ Expertise sur les Risques, L’Environment , la Mobilite, et L’Amenagement (CEREMA) that enabled a calculation of the rise in water levels attributed to Irma, which were significantly higher than of those in the 2011 plan. The next public meeting to present the plan will be on April 23. That will be followed on May 10 with a presentation on the zones and rules that apply.